Weighing just 2.8 ounces, counting the small Secure-Ex sheath and dogtag style neck chain, the Point Guard can be tucked away beneath clothing or lashed in place in easy reach. Arrange it properly and it's a handy tool you'll not even think about. If you need it, the high carbon AUS8 stainless steel Point Guard provides 4 inches of plain hollow ground cutting edge. The overall length of 6-3/4 inches doesn't leave much for the grip, but the design improves on features experimented with in other knives, and turns out to be very usable. Inspired by a Fred Perrin custom knife design, the large hole accommodates an index finger and the open pistol style grip allows a fairly comfortable and secure three-finger hold. Held solidly in the hand, there's nowhere for the blade to go except where you point it. The system should fit the hands of nearly every user. The finger hole doubles as part of the sheath's latching mechanism -- a rounded tab friction-fits into the hole and keeps the knife secure in any position, even upside-down. Grab the hilt and give the knife a firm pull, and it slips easily from the sheath. This is one neck knife you don't need to worry about bouncing loose. 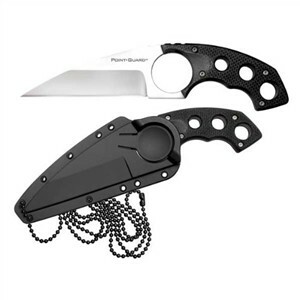 See the Cold Steel Double Agent knife for a similar neck knife in a karambit style.